I am very suspicious of something I noticed about the Drudge Report lately, I think it might be someone trying to attack them with negative SEO. Only 2-3 months ago I was setting up a Drudge style website for someone so I was looking at how Matt Drudge had setup his website, including the page structure and what pages were indexed. However, in the last couple of days I noticed that Google has been picking up thousands of non-canonical versions of his front page with various URL parameters. Just in the few pages of results I looked at there were numerous parameters being used so this isn't just some glitch created by Googlebot looking for things, it almost looks intentional. 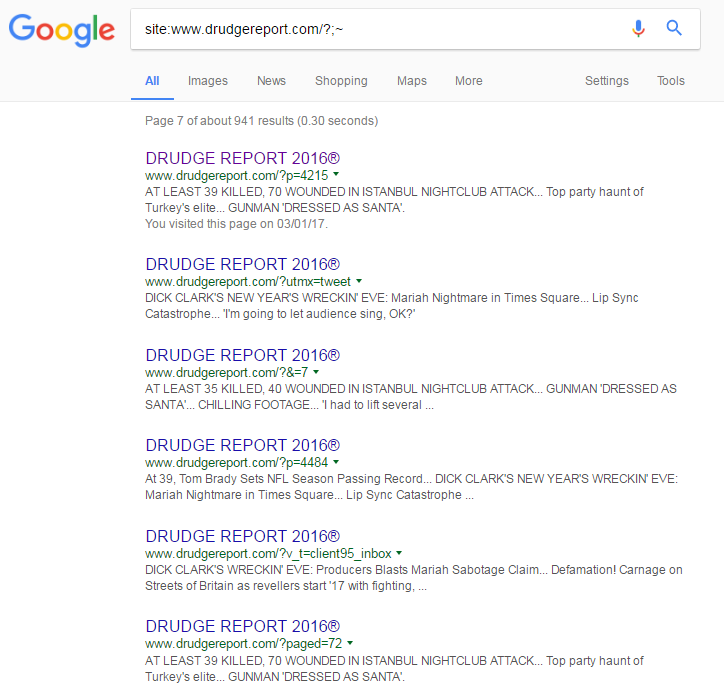 What was even more interesting was that 2 of these versions of the site are showing up as site links when you do a Google Search for "Drudge Report".